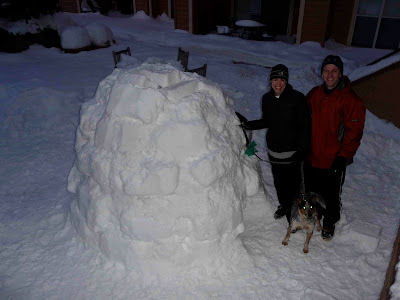 An Engineer in DC: Igloo finished! After about 4 hours (total) of work, the last block was placed on the igloo! The top went together fairly easily, largely aided by MUCH better snow conditions today. The string of large blocks we left out during the day solidified nicely, and even the small bricks (visible on the top in the above picture) came up nicely. There is a lot of snow in that igloo. So, some more details on construction. Below are the two types of blocks we used: a storage tote, and a smaller plastic bin. The tote is 23.5" x 17.5" x 15.5". The plastic bin is ... well ... smaller. In an ideal world, the large plastic tote would be 10% to 15% smaller so it would be easier to handle. On the other hand, it sure was nice getting those big blocks into place and seeing some serious progress with each block. Having two people sure was nice. When you get towards the top, they start angling in pretty severely, and it's very nice to have someone stand on the inside and hold the bricks in place while you pile more snow in and stack other blocks. We think it'll last for a while. Other tenants of the apartment complex have been very interested in it, and a few have even been curious enough to climb inside. We hope they have fun, too.